There’s a story told of the theoretical physicist Wolfgang Pauli that a friend showed him the paper of a young physicist that he suspected was not very good but on which he wanted Pauli's views. Pauli remarked sadly "It is not even wrong”. For a theory even to be wrong, it must be predictive and testable and falsifiable. If it cannot be falsified - if it does not make some prediction that could in theory be tested and proven false - then it does not count as science. So tech is just a lottery? The problem with both of these lines of argument is that they have no predictive value. It is unquestionably true that many of the most important technology advances looked like toys at first - the web, mobile phones, PCs, aircraft, cars and even hot and cold running water at one stage looked like faddish toys for the rich or the young. Even video games, which literally are toys, are also largely responsible for the GPUs that now power the take-off of machine learning. But it's also unquestionably true that there were always lots of things that looked like toys and never did become anything more. So how do we tell? Is it that 'toys' occasionally turn into something else through some unpredictable chance? Do we throw up our hands and shrug? William Goldman famously said of Hollywood “Nobody knows anything”, but that feels like an abdication of reason and judgement. We should try to do better. So, what do we mean when we say that some new piece of technology is a toy? It seems to me that there are two parts to this: either it doesn't work, or it won't matter even if it does work. On the one hand, it cannot do what it is supposed to do because it is incomplete, impractical or expensive, and on the other, even if it does work no-one will want it, or, perhaps, even if they do it won't matter. These are all effectively assertions that nothing will change: the product won’t change, or people’s behaviour won’t change, or the things that are important won't change. How can we predict whether something will change? Let's start with whether it can work. Imagine if you had seen the Wright Brothers’ Flyer in 1903. It was small and flimsy, and it could only carry a single person a few hundred meters. But it was a theoretical breakthrough, and it was entirely clear that it could be expanded upon to get to something that could carry several people several hundred miles, and perhaps more. Blériot flew across the English Channel just 6 years later. Move from wood and fabric to aluminum, and make more and bigger engines, and there was a clear roadmap to the Dakota and the Lancaster. You could have plotted the next couple of decades, and indeed people did. It was plenty of work to get from the Flyer to the Constellation, but there was no barrrier of principle to cross. There did come a point at which piston engines could be taken no further and we needed something else - you could not use them to build a 707, let alone a Concorde. That something else turned out to be jets, and you might not have predicted jets in 1903 (though ships already had turbines). Jets delivered the power and efficiency to create mass air transport, and make flight truly cheap as well as practical. But the breakthough of 1903 was enough to take us forward for decades. 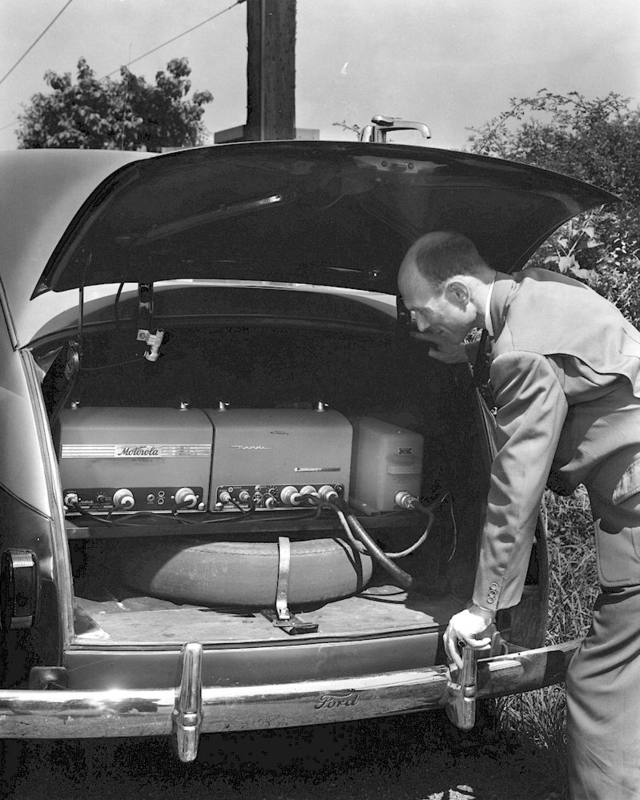 The first car phones appeared in the late 1940s, and were deployed across many cities in many countries. Here, though, there were two fundamental problems: there was no roadmap to get them from something that filled the trunk of a car to something that you could carry, and there was no roadmap to use spectrum in ways that allowed millions of simultaneous calls in a city instead of dozens of calls. These combined also meant that the product was extremely expensive. Solving the first of these, to minaturise the device, needed the entire computer revolution to happen (and this had barely started), and solving the second needed the theoretical breakthrough of cellular itself and successive theoretical breakthroughs around multiplexing (TDMA and CDMA*). 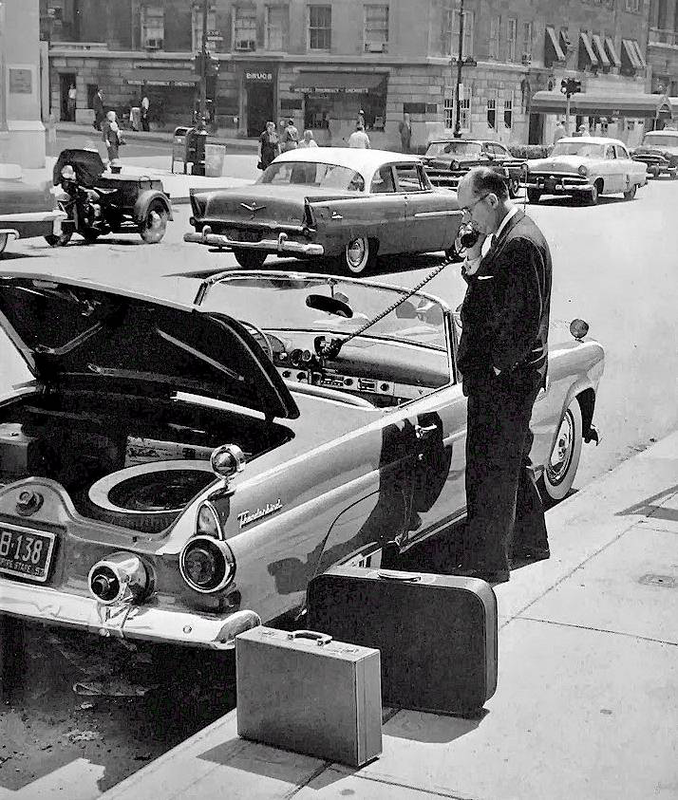 Unlike flight in 1903, 'mobile' phones in 1947 had no path to improvement that anyone could start working on in 1948. There were fundamental barriers that could not then be overcome, and no amount of iteration on what you already had could get you from there to a world of $5 phones and 5bn mobile users. In 1947, mobile phones were a toy. It was only thirty years later that we had enough of the necessary breakthroughs: we had the concepts of spectrum use and we had the computer industry that could implement those concepts in silicon. It was in the 1970s, not the 1940s, that mobile phones reached the Flyer stage, and the history of mobile since then looks much more like the history of flight since 1903. In 1947 there was no roadmap to make mobile phones more than toys - in 1977 there was a roadmap. Mobile phones in the 1940s may have been toys, but there was at least some sense that at some point in several decades' time it might be possible to make something useful with the same basic principles - radio, plus a microphone and speaker, plus a phone number. That isn't always true. In 1960, rocket packs looked just as limited and impractical as the Wright Flyer in 1903. Indeed, just like the Flyer, they could carry one person a few hundred meters and nothing more. The crucial difference was that the Wright Flyer was a breakthough of principle that could then be expanded upon and the rocket pack was not: it could not be expanded. It flew for only 21 seconds because that was how much fuel you could carry, and there was no roadmap of iteration and improvement to change that (well, not much: the subsequent 60 years have improved this to 30 seconds). To get more range you need more fuel, but then you weigh more and so need more fuel again, and there is no amount of iteration that can solve that - you need some new and discontinuous technology. Rocket packs look more like hot air balloons in 1783 than they do the Wright Flyer - they're not the first step on a journey. The question, then, is not whether something works now but whether it could work - whether you know how to change it. Saying 'it doesn't work, today' has no value, but saying 'yes, but everything didn't work once' also has no value. Rather, do you have a roadmap? Do you know what to do next? The Wright Flyer looked like a toy but was in fact a breakthrough in flight with a clear roadmap that was easy to follow for it to become something huge almost immediately. 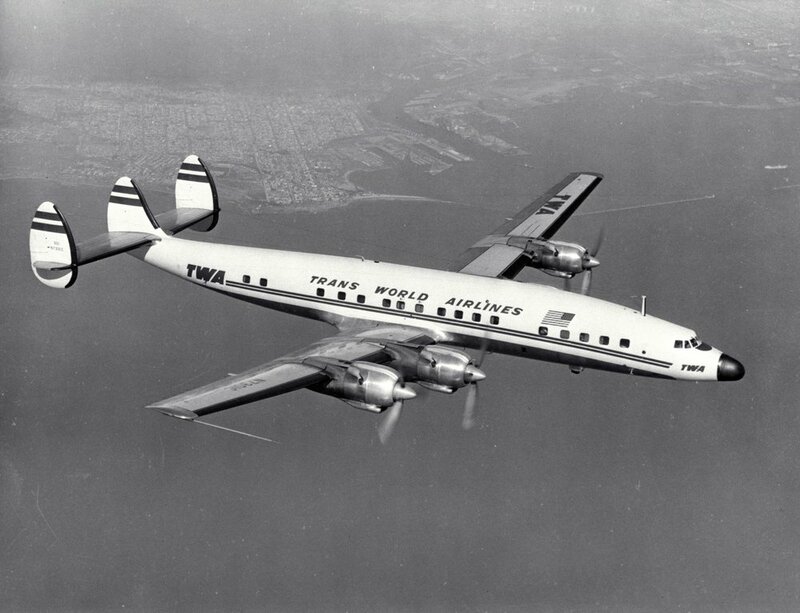 Then we needed another breakthrough, around jets, to get to cheap mass air travel in the second half of the century. Mobile phones in 1947 had no roadmap to become a mass-market product, but mobile phones in 1975 or 1980 absolutely had such a roadmap, with a path to make them cheap and universal. Rocket packs have remained a toy and we have never had any roadmap for making them anything more. Bringing this back to 2017, I've suggested elsewhere that voice interfaces do not have a roadmap to become universal computer interfaces or platforms. Machine learning now means that speech recognition can accurately transcribe the sound of someone speaking into text and that natural language processing can turn that text into a structured query - that's one breakthrough. But you still need somewhere to send the query, and it is not clear that we have any roadmap to a system that can give a structured answer to any query that any person can pose, rather than just dumping you out to a keyword search of the web. To even start making voice interfaces useful for general purpose computing rather than for niches, I would suggest that we would need general AI, which is (at best) a few decades away. I don't think that anyone believes that if we had general AI, it would be a toy - indeed it's more likely that it would think that we were a toy. But there are plenty of other important technologies that were dismissed on the grounds that even if they did work, they'd be useless. If you can analyse whether a technology has a way to become something that works, can you also analyse whether it has a way to become something anyone would want? First of all, it's quite common, especially in enterprise technology, for something to propose a new way to solve an existing problem. It can't be used to solve the problem in the old way, so 'it doesn't work', and proposes a new way, and so 'no-one will want that'. This is how generational shifts work - first you try to force the new tool to fit the old workflow, and then the new tool creates a new workflow. Both parts are painful and full of denial, but the new model is ultimately much better than the old. The example I often give here is of a VP of Something or Other in a big company who every month downloads data from an internal system into a CSV, imports that into Excel and makes charts, pastes the charts into PowerPoint and makes slides and bullets, and then emails the PPT to 20 people. Tell this person that they could switch to Google Docs and they'll laugh at you; tell them that they could do it on an iPad and they'll fall off their chair laughing. But really, that monthly PowerPoint status report should be a live SaaS dashboard that's always up-to-date, machine learning should trigger alerts for any unexpected and important changes, and the 10 meg email should be a Slack channel. Now ask them again if they want an iPad. In the enterprise, new technology tends to solve existing problems in new ways (or of course solve the new problems created by the new tech). In consumer products, it's more common to seem to be proposing a change in human behaviour, and so in human desires. You may in some underlying way 'really' be replacing an existing behavior in a different way, as Word replaced typewriters and email replaced Word, but that line of reasoning can easily lead you to unfalsifiable assertions when you move up Maslow's Hierarchy. 'Millennials care less about driving because smartphones give them their freedom now' certainly sounds good, but I have no idea how you could tell if it's true, far less predict it. This is not a falsifiable analysis. All that you can hold in your hands is that you're proposing a new human desire, and that's a subjective view, not the objective analysis one could do of the roadmap for flight in 1903 - worse, it requires a change in your subjective view. You don’t think that you want to listen to music walking down the street, and you don’t think that you want to be able to call anyone from anywhere you might be. The argument for progress here is effectively false consciousness - 'you think you don't want this, but you are wrong, and one day you will realise the truth of your own feelings'. But you can't ever know this - again, you can't falsify it. One way to solve this problem is to try to separate the fundamental capability that's being proposed from the specific uses. Edison thought that sound recording would be good for sermons, not music, and it’s hard, and perhaps impossible, to tell what people will use the new thing for. But sound recording and one-to-one and one-to-many sound transmission were much more fundamental changes than the ability to listen to a sermon on demand. What mattered was seeing the value of the capability, not predicting any particular applications. The mistake to make in looking at Edison's recording technology would have been to argue about whether people wanted sermons - the mistake is to look only at the application that this technology is proposed to provide, and not the actual capability that has been created. Sermons might not work**, but sound is a big deal. You can see a more recent example of this mistake in the video below: "mobile phones are better payphones that are useful for people who travel a lot". If you focused on the application rather than the capability in this way, you'd have thought that the mobile opportunity was, say, 25% of the population of rich countries and that no-one else would want one, whereas in fact 99% of the adult population of Earth will have a mobile phone in the next couple of years. Where Cellnet missed it, Orange got much closer to the actual capability: the future is wire-free. Why is your phone tied to the wall of a particular room with a piece of wire? Cellnet was guessing about applications while Orange talked about the breakthrough. To give one more example, in 2000, it seemed as though the only question any telecoms investor ever asked was 'what's the killer app for 3G?'. It turned out that the killer app for having the internet in your pocket was having the internet in your pocket: a general technology breakthrough matters not because of a particular application that it enables but because of all and any of them. I had little idea of the specific ways you'd use your phone to access all the world's information and share stuff with your friends, but it was a safe bet you'd want to do it somehow. So, the use cases are subjective, but the capability is objective, and it's the capability that matters. Really, the new technologies that matter give us superpowers. Is that what we've made this time? Electricity is a superpower, and so are cars, and flight, and mobile. I can rub my watch and tell the djinn that lives inside to summon a car, and there'll be one waiting at the door. We can hear, or see, or travel, in ways we could not do before. Where we go and what we listen to are secondary questions. You can't necessarily predict the applications, but you can predict that people will like having a new superpower. What you do with your superpower is up to you. Returning to Pauli, the test throughout this post is falsifiability and predictive power. "That is a toy', 'everything looks like a toy', 'no-one will want that' and 'no-one wanted phones either', paradoxically, are statements that are both completely true and 'not even wrong': you cannot use them as a test for anything. They have no predictive power. Of course, asking whether there is a technology roadmap, or whether this is a superpower, are analytic projects that might get you to the wrong answer. But they do give you a roadmap to understanding what might happen.